“It all began when I was living in a log cabin in the Purcell Mountains and cooking on a wood stove”, Carole Ruth explains. Before that Carole knew nothing about wood stoves. Even her grandmother didn’t have one. During her years in the log cabin she became an expert. And that’s where she learned to spin. In fact she even traveled to Christchurch, New Zealand to learn more, and when she returned to Canada she brought back a spinning wheel. “In New Zealand you can go to a department store and buy a spinning wheel.” Her cooking, spinning, gardening and other accomplishments helped Carole get a job she’s held for nineteen years. In 1989 the historic O’Keefe ranch located near Vernon, B.C., decided they needed a pioneer woman to demonstrate old-fashioned skills in the log house on the heritage site. Carole applied and was hired. She also demonstrated a Singer sewing machine. Not a ‘modern’ one with a foot treadle, no this one had the wheel turned by hand. On it Carole sewed costume skirts for the female tour guides at the O’Keefe ranch. At the end of August 1989 Carole asked the manager if he’d be interested in hiring her again. He replied that he’d like her back but would she be Mrs. Schubert? Carole had been keeping an eye on the Schubert house, home of the famous Schubert family, who came west from Fort Garry bound for the B.C. goldfields. Unlike other gold seekers, the Schuberts traveled as a family. Among the 150 Overlanders were Mrs. Schubert, who was pregnant, and three small children. On Oct. l4th, 1862, the day after their arrival at Fort Kamloops, Mrs. Schubert gave birth to a daughter, Rose, in a tent hastily erected in four inches of snow. Rose is said to have been the first ‘white’ child born in the B.C. Interior. In 1863 the Schuberts moved to the Cariboo, closer to the Barkerville gold fields. In 1877 Augustus Schubert pre-empted land near Spallumcheen in the Okanagan. Generations of Schuberts were active in the area as Reeves, councilors, teachers, business people and Justices of the Peace. The farm itself remains in the Schubert family. The original house, built in 1892, was donated to the O’Keefe Ranch as a heritage building. At first it was located way over by the road, far from the other buildings. One day when Carole came to work she couldn’t believe her eyes. The house had been moved to just across the bridge from the animal shelters, and barns. So, in 1990, Carole became mistress of her own house, the Schubert house. At first she thought she’d be lonely away from the main demonstration buildings, but that hasn’t been the case. She wrote a proposal for her job as Mrs. Schubert, but it was up to her to decide exactly what she did. She tries to give visitors the feeling of day to day life in the 1890s as well as tell the story of the Schubert family and the house itself. 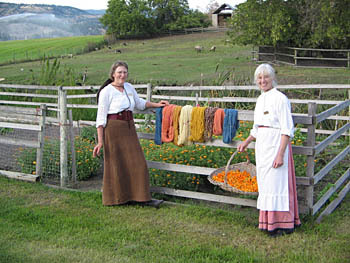 To do all that she cooks, spins, dyes wool from the ranch sheep, does laundry as Mrs. Schubert would have done and makes the house come alive. In 1890 Carole searched basements and attics at the ranch for furniture to complement the house, the kitchen cupboards and hanging lamp, were brought in. She researched archives for cookbooks. The best information came from a note book with recipes hand-written by Molly Greenhow, daughter of Thomas Greenhow who was Mr. O’Keefe’s partner. They’re mostly cookie recipes. No temperature is given, “Bake till slightly golden” is the guide. When she arrives in the morning she lights the stove immediately, changes to her costume, (in the pantry), and wipes off the counter where she’s going to bake. It speeds the process that she’s previously mixed dry ingredients and stored them in the eighty year old General Electric refrigerator which works very well. 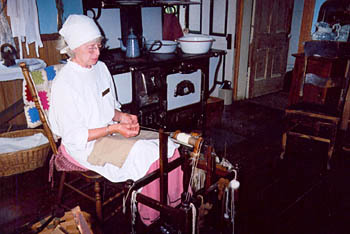 Spinning is Carole’s other major activity at the Schubert House. The ranch sheep are sheared in the spring. In previous years their wool would be sent to woolen mills to be cleaned and carded but those mills have closed. In 2008 Carole and Sue Moret ,a fellow spinner and O’Keefe employee, picked the best fleeces, washed them in soapy water and borax and, after using alum as a mordant to fix the dye, had a ‘wool dying day’ using natural plants for the colours. “Marigolds gave a brassy golden colour, onion skins, yellow; calendula, a pale yellowy cream; madder root, pink; and nettles a sort of khaki green. “ The plants came from the garden round the Schubert House. Carole herself planted them eighteen years ago. Now they self- seed and have to be weeded out. Some quart jars of the dye are left over to be used next time. them spin a little and gives them what they’ve spun to take home. One person started to play a string game with the spun wool. After that Carole would show games such as cat’s cradle to the visitors and often they’d show her new games she didn’t know. Playing string games on a long car drive might be an old/new way to keep kids amused. However that really puzzled the kids and, since no one else at the O’Keefe center does any character acting, she gradually exited from that approach. Now she’s a narrator, representing a person of that time. She tells the story of the Schubert family and the reason the house is there. People leave knowing that the family came west for gold, eventually settling near the O’Keefe’s and were very influential people. She mentions that the family still lives on the Schubert farm. When people look around they often say, “Oh, I remember a lamp like that!” or “My grandmother cooked on one of those.”, especially if they lived on a farm or in a remote area. There are very few visitors from the U.S. Most tour groups are from Germany, then Belgium and Holland. “If you hear French spoken, it’s a group from France, not Quebec” says Carole. Language is not a problem. One tour guide at the O’Keefe Centre speaks German, French and Dutch. Europeans see things that are similar but not the same; they can compare how a kitchen in their own countries would have been furnished in 1892. Schubert is a German name. Some people, before they come, have read in the tourist guides in German about Catherine Schubert and want to see where she lived. Mr. Schubert was from Dresden and every so often someone will come in from Dresden. They are usually fascinated to see the house associated with a family they’ve read about. 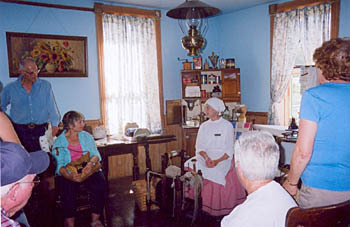 Carole will be back next year, mixing cookies with history and keeping alive Canada’s pioneer legacy.